Who lives in a pineapple under the sea? — If you know the answer to this question, then you’ll probably like our Spongebob nails. 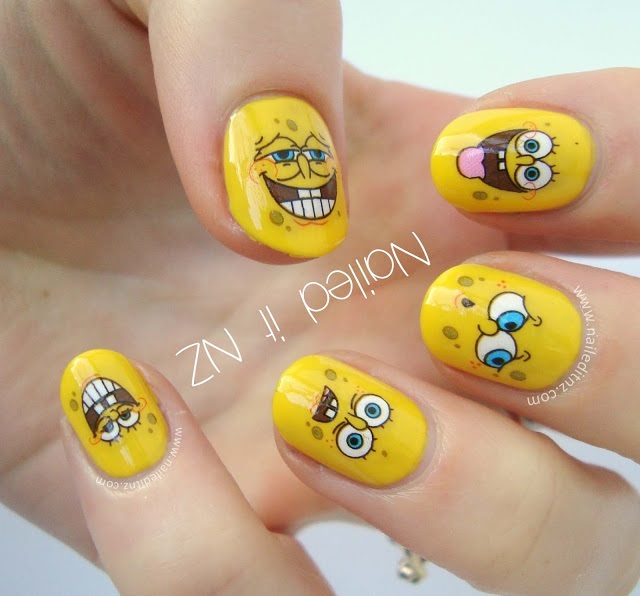 If you’re looking for Spongebob nail designs, then you must be a fan or at least watch this popular cartoon show. Spongebob Squarepants is the iconic walking and talking sponge who lives in Bikini Bottom. Nowadays, people only need to see a yellow kitchen sponge to think of this weird yet funny cartoon character. As expected, there’s a lot of interesting Spongebob trivia that isn’t too well-known. For example, did you know that Spongebob was originally going to be named Spongeboy or Bob the Sponge? There’s also a newly-discovered species of fungus that’s actually named after Spongebob — the Spongiforma squarepantsii. Maybe they were Spongebob fans, too? Most of our cartoon nail art below is immediately recognizable though. We’ve got Patrick, Squidward, Plankton, Mr. Krabbs, and even the adorable Gary! Have fun with our Spongebob nails!